The sky was colored various shades of gray as the clouds hung low. The wind blew rather harshly, and the chilly air sent shivers down my spine; it was a trademark October day, and I couldn’t think of a better place to spend it than in a cemetery. 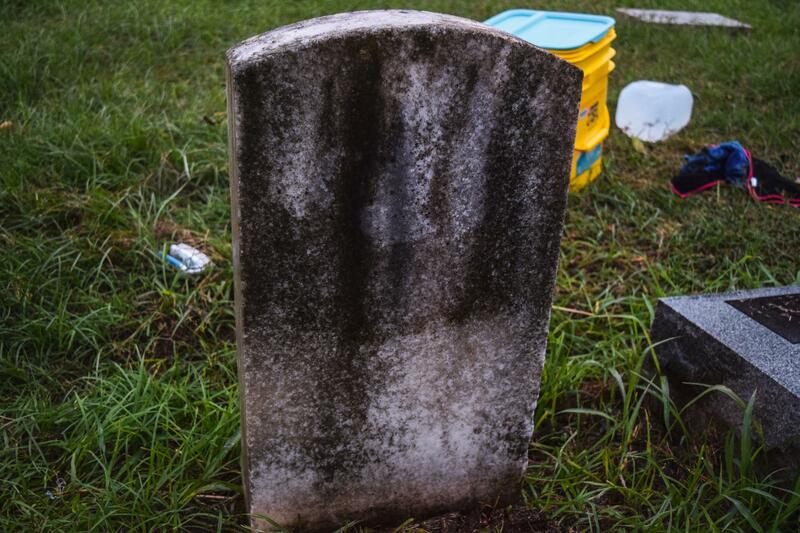 Milstead was meeting with me because we share the same passion: cleaning and conserving headstones. Milstead grew up in a cemetery, you could say. There was an old graveyard within spitting distance from his childhood home, and the cemetery behind his family’s church was a frequent “hang” for him, particularly throughout his teenage years. Milstead explained that he spent most of his childhood in a funeral home, attending various funeral services of his parent’s friends and family members. 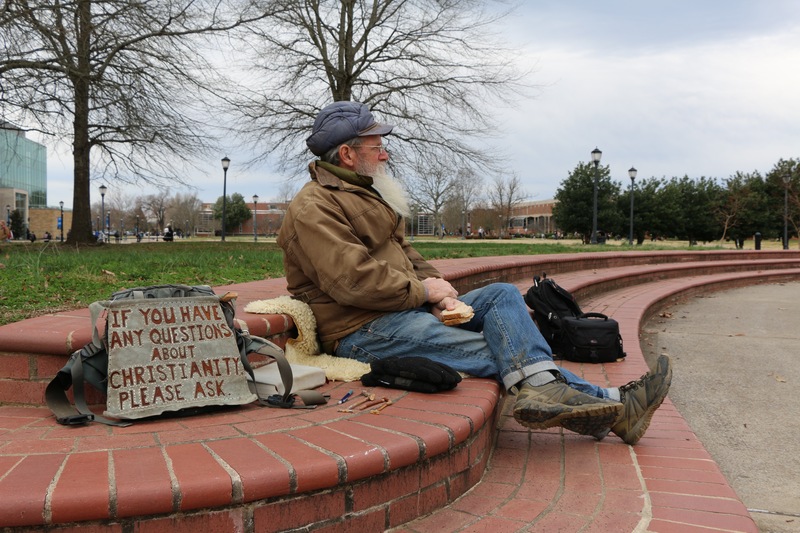 He says that he was always eerily fascinated with funeral homes, which explains why he ended up working as a financial auditor for the Tennessee Funeral Board for four years. The board licenses and regulates funeral directors, embalmers and funeral establishments. He audited “Pre-Need” plans, which is where people pay for their loved one’s funeral up front. 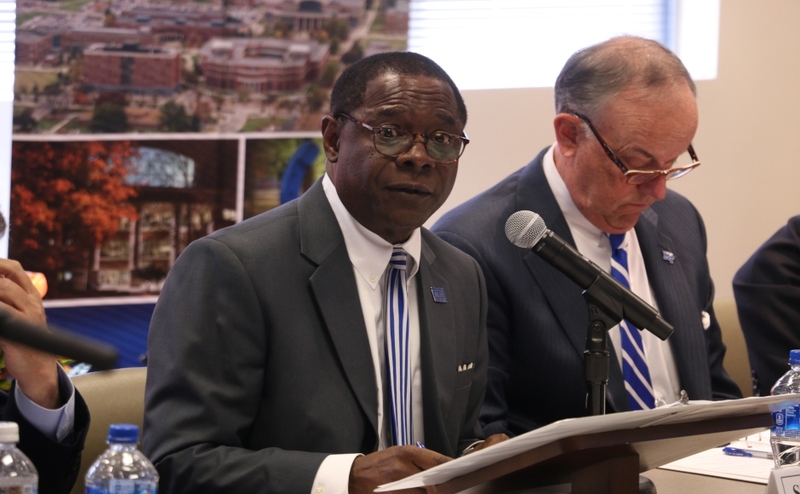 Milstead claims that he’s “seen it all” through the job. 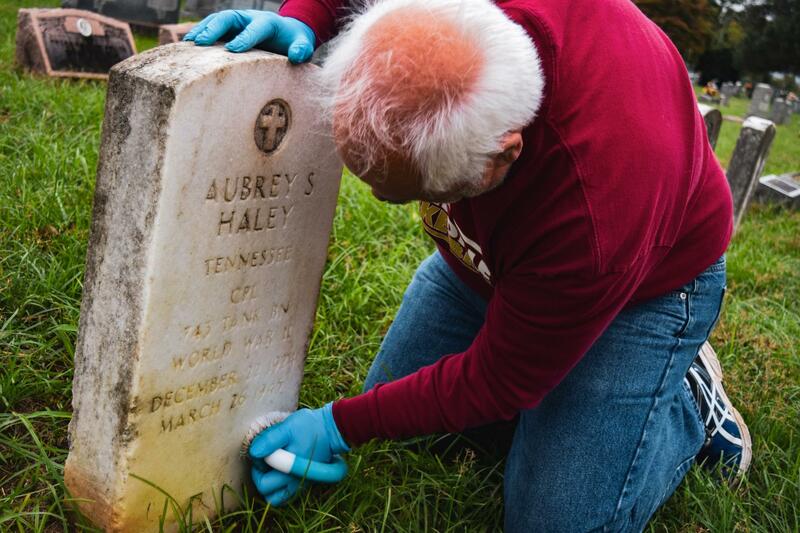 It was seemingly meant to be for Milstead to gain interest in cleaning headstones, not only because of his constant exposure to funerals and cemeteries but because of his dedication, love and care for all sorts of veterans. Grave Undertakings (Monument Restoration and Cleaning) is Milstead’s project that has taken-off and was “formed to promote the preservation of history through the care and restoration of World War II casualties.” However, “since then, Milstead continues to restore and research the history of our fallen heroes,” according to the Grave Undertakings Facebook page. Milstead’s father and uncle served in WWII. His uncle, along with Cpl. 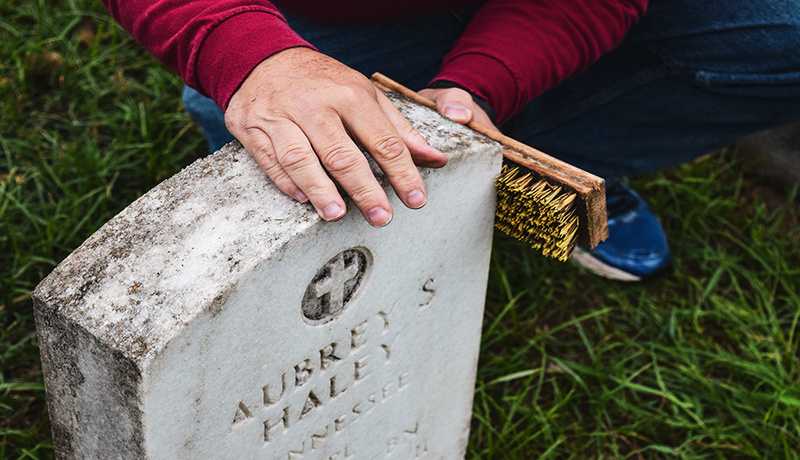 Aubrey Haley, were buried in Margraten, Holland, before their bodies were brought back to the U.S. The wind was chilly as we stood outside his car, taking all the supplies that we needed out of the trunk. We both had our arms full of supplies as he showed me over to Haley’s resting place. The air seemed heavy as we stood in front of his almost white, but sparingly mold-laden, headstone. Milstead was eager, as was I, and he handed me a sheet of newspaper articles he had printed out; they were all articles from the Daily News Journal written when Haley was wounded, when he passed away and when he was to be buried at Evergreen cemetery. Haley was the son of Lascassas parents, born on a cold December night, the 22nd, of 1924. Haley spent his high school career at Central High in Murfreesboro and entered into the service on March 12, 1942, going overseas in September of 1944. 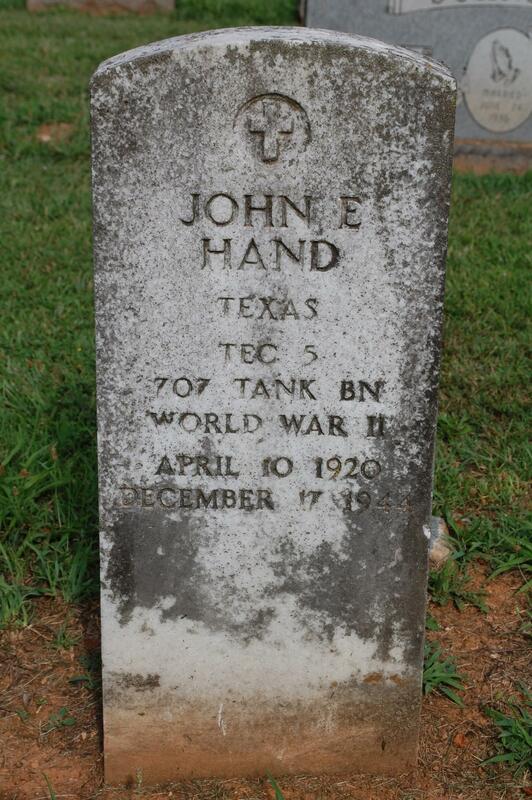 After Haley was wounded, he returned to the line, working as a member of the 743 Tank battalion unit of the Ninth Army. Haley was killed in action in the European Theatre of Operations on March 26, 1945, around a month after the Daily News Journal reported his wounding and only six months after he had gone overseas. Haley was buried in Evergreen Cemetery in early July 1949, just over four years after he had been killed in action. “There is a very famous scene in the movie ‘Patton’ that shows one of Patton’s soldiers that was killed, and I’ve always remembered this, even being a very little boy when I first saw it, there was no wood for coffins,” Milstead said. Just a few yards away from Haley, the Prater brothers, who were both veterans as well, were buried. Milstead took a second, before we began cleaning Haley’s headstone, to show me where the Prater brothers were buried and how they got there. 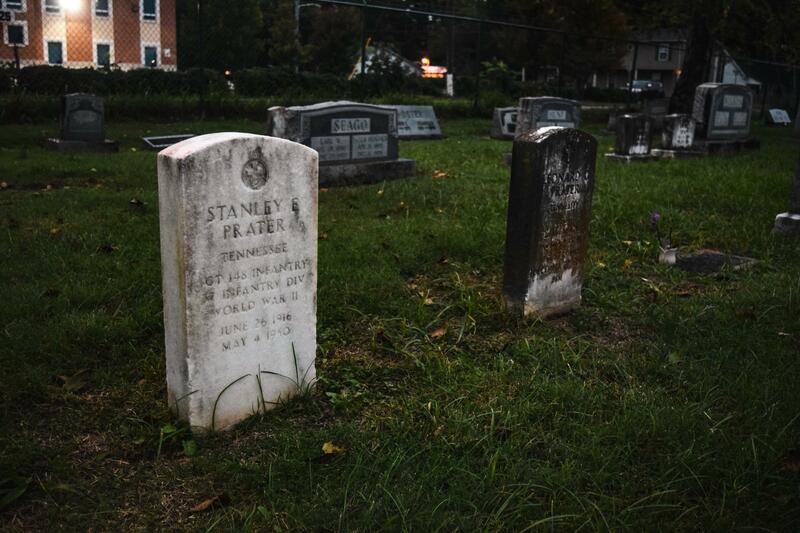 Stanley Prater’s stone was one that Milstead had already spent time cleaning and taking care of. 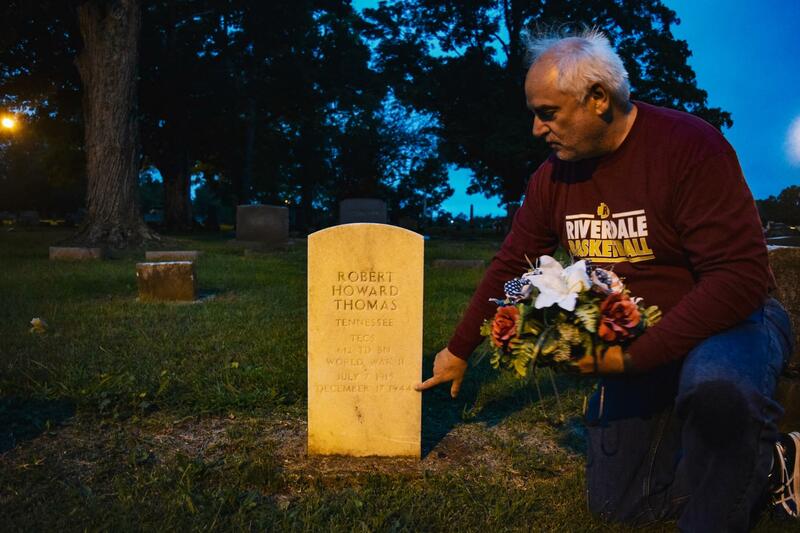 The headstone of his brother, Leonard, wasn’t even recognizable as the white, marble stone that represents a veteran soldier; Milstead had yet to clean the second Prater brother’s final resting place. 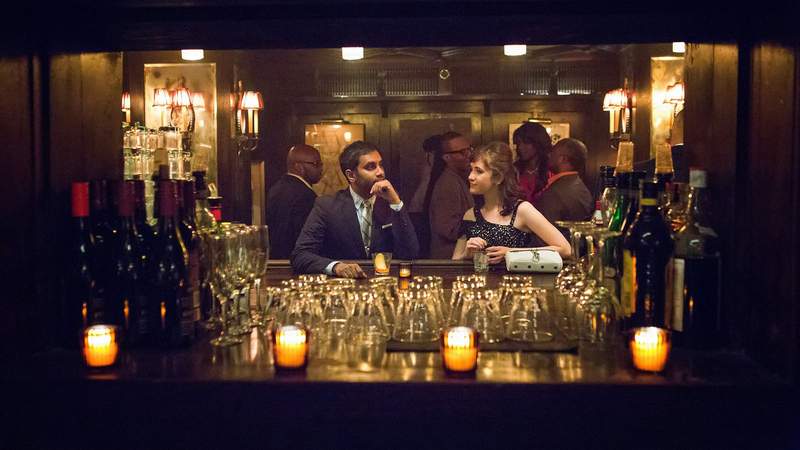 I looked at Milstead, amazed in what I saw and how much of a difference his work really makes. Milstead took me back over to Haley’s final resting place, taking tools out of a recycled cat-litter box, which he thought I would make fun of him for but was perfectly useful. “Here is what we’re gonna do first: ordinary bristle brush, never ever ever use metal,” Milstead said. He began moderately scrubbing the marble stone. 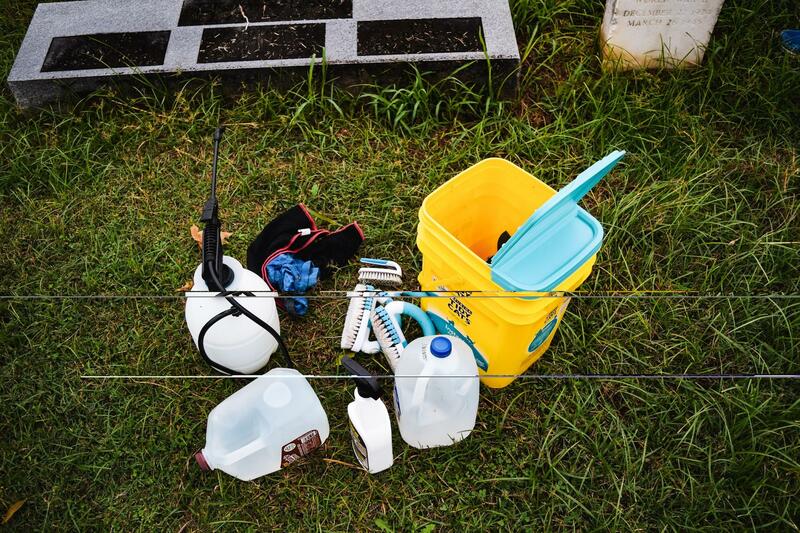 In order to properly clean a headstone, Milstead explained all the proper tools needed: a soft bristle brush, a small bristle brush, wooden cuticle sticks, plastic paint scrapers, Orvus soap, one gallon sprayer or bucket, lots of water and the “magic” D/2 Biological Solution. Milstead stopped, getting up and taking his phone from his pocket. Milstead explained that it’s best to work from the bottom of the stone to the top, so the cleaning doesn’t streak the stone. After mixing the Orvus soap, one tablespoon to one gallon of water, it’s important to cover the entire stone generously, soaking any biological growth. It’s important to wait for the soap and water to soak into the stone, which then leads to using the paint scraper to get rid of any biological growth that you can. The small brush and wooden sticks come in handy for cleaning out letters, numbers and any sort of decoration on the stone. Milstead explains that after spraying, you will be able to see a difference in the lightness of the stone within a couple of days. It takes up to six to eight weeks and sometimes longer for the full effect of the biological solution. 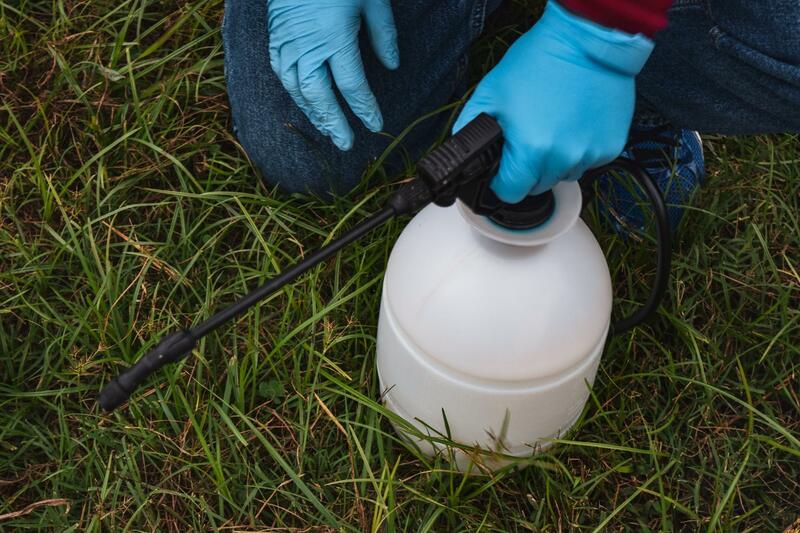 After around eight weeks or so, Milstead says that you can re-apply the D/2 to take care of any problem areas that might arise. Milstead and I spent around an hour cleaning Haley’s stone together. Our knees were muddy, and a sting of pain shot through my arm as I continued to scrub. “This is definitely where I build up my arms,” Milstead said. He laughed as I told him about my arm, which is still sore, by the way. We stood in front of his clean stone, shining white against the damp surroundings. After we gathered the supplies and put them back into the trunk, Milstead asked if I’d like to see the other stones he has cleaned in Evergreen. 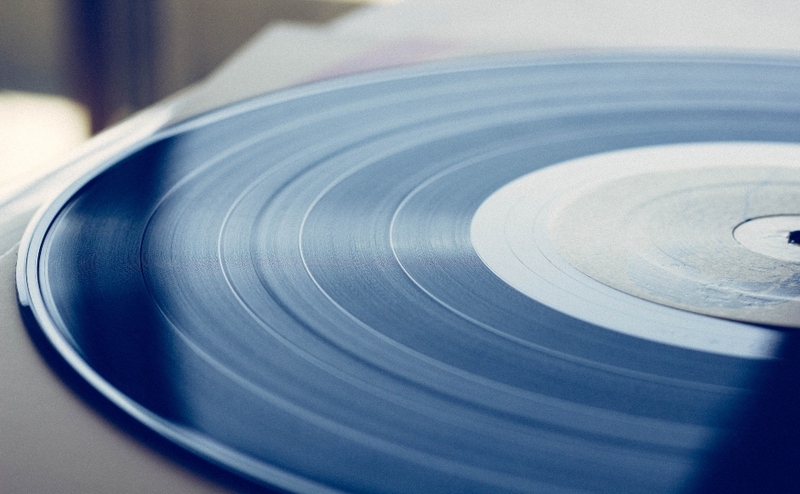 We chatted consistently as we walked through Evergreen’s hauntingly beautiful landscape. He took me through various stones, stopping occasionally to tell a funny story or tell me more about the soldier’s stones that he has cleaned. We came up to a darkened area, shaded by a massive pine tree; a white marble cross stood proudly, glistening occasionally when the wind blew and shifted the patterns splattered across with orange streetlight. Milstead was beaming; it was evident this was his passion, and it was a beautiful thing to witness. He gripped unto the stone. 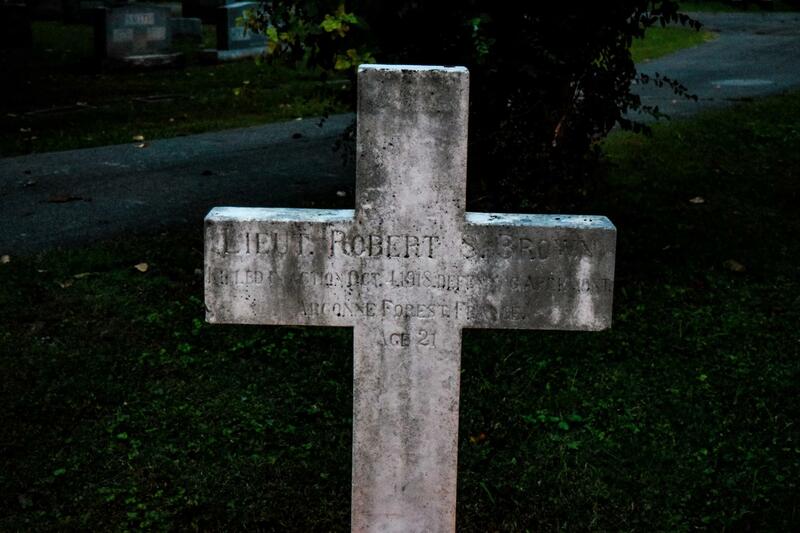 “This is Lt. Robert Brown, and he was one of the very first stones I ever cleaned,” Milstead said. Brown was killed in action during WWI in the Argonne Forest in France on Oct. 4, 1918; he was only 21 years old. 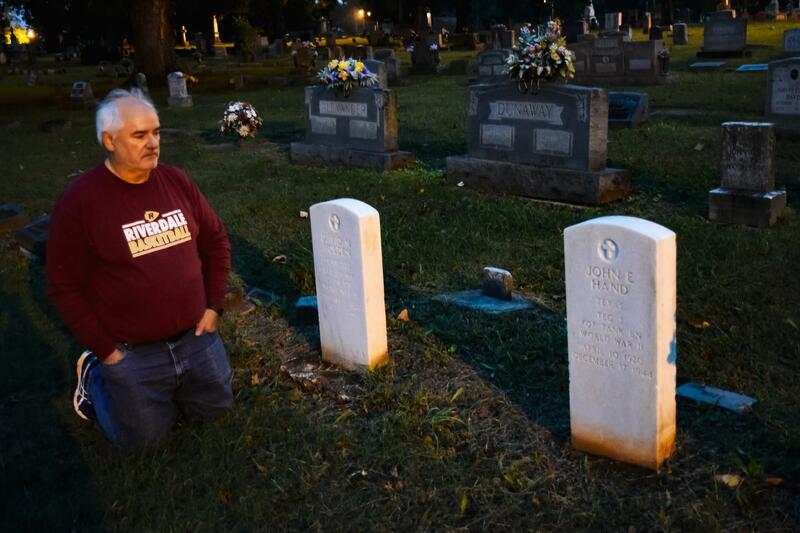 As darkness descended upon us, Milstead brought me to two headstones toward the back of the cemetery. Two white, marble stones seemingly stuck out against the darkness as we approached them. Milstead dropped to his knees in front of them, David M. Holden and John E. Hand. Milstead cleaned their stones for the first time this summer, researching them and their history but not coming up with much. Milstead, still on his knees, begin to tear up, unable to hold his emotions back anymore. “So now, these are my boys, too,” he said. His tears showed me that this just isn’t a hobby. This work has meaning for him and the men who died for our country. Milstead and I walked side-by-side through the darkening cemetery, back to our cars. The orange street lights cast patterns across the winding road, dancing off the shiny tops of the granite stones that surrounded us. I told Milstead that he had taught me more than how to clean a headstone. He had shown me inextinguishable passion and had taught me that every stone in the cemetery had a story, waiting to be uncovered.